VILLAGE OF PINEHURST, N.C. (April 20, 2016) - Pinehurst Resort has been honored with two Editor’s Choice awards from Golf Digest in its upcoming May issue. The resort was named as one of the Best Golf Resorts in the Americas while the Pinehurst Golf Academy earned a nod among the nation’s Best Golf Schools and Academies. The Pinehurst Golf Academy, led by Eric Alpenfels, was also praised. Alpenfels, a Class A PGA of America Master Professional, has in previous years been named as one of “America’s 50 Greatest Teachers” by Golf Digest and one of the “Top 100 Teachers in America” by Golf Magazine. But the Academy’s expertise doesn’t stop there. Kelly Mitchum, a former North & South Amateur champion who has appeared in four PGA Championships and 25 PGA Tour events, is part of a staff of lead golf instructors (including Paul McRae and Geoff Lynch) that boasts more than 75 years of combined teaching experience. It’s that kind of expertise that caught Golf Digest’s editors’ eyes. The Pinehurst Golf Academy runs weekly and weekend schools throughout the year. From three-to-four instructors will work each school, depending on enrollment, and each school includes video analysis and time spent on the full swing, chipping, pitching, sand play, putting and course management. The Academy’s schools are also unique, offering schools specifically designed for parents and their children, for junior golfers and for Academy alumni. 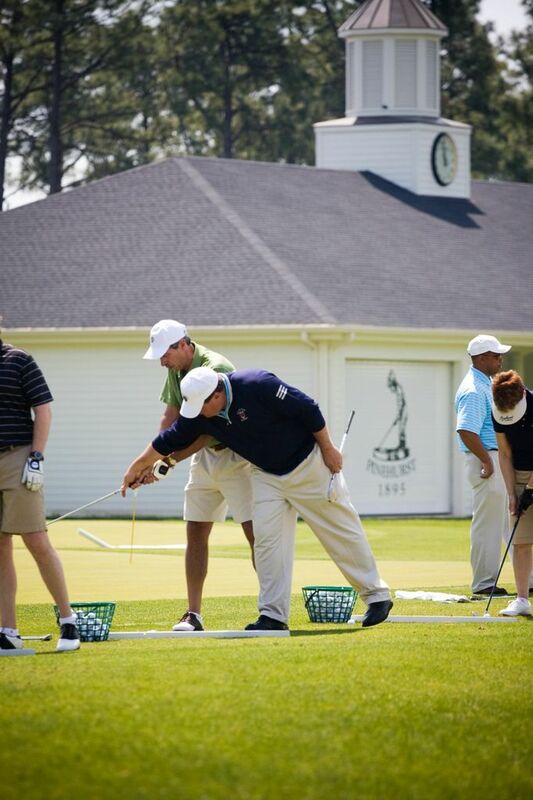 The Pinehurst Golf Academy offers a unique blend of situational practice and on-course instruction. Students enjoy a round of golf each day, so after working on your skills on the practice range, they have the chance to test what they’ve learned on the course with an instructor. The Pinehurst Golf Academy is also an industry leader in golf research. The staff has used Academy students as well as resort guests and members to participate in studies that have measured questions ranging from whether golfers can better practice lag putting by looking at the hole during the stroke rather than the ball; the effectiveness of various drills for curing the slice; and whether aiming at a pinpoint target on full shots yields better results than fixating on a larger target. For more information about the Pinehurst Golf Academy, or about which golf school is best for you, please go here.